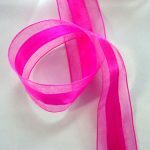 Hot pink ribbon with satin centre and organza outside with edge. 38mm ribbon. Sold per metre.